Benetti revealed four new concepts at the Fort Lauderdale International Boat Show earlier this week (November 2), all of which were designed in collaboration with British studio RWD. The new contemporary designs expand the BNow collection, which began at the Monaco Yacht Show 2016. The first designs featured exteriors by Stefano Natucci and interiors by RWD, but this time around, the British studio has taken charge of the exterior styling and the result is a clever interplay of curves and straight lines, culminating in an almost vertical bow. The four models range stretch up to 68 metres in length, while the smallest is defined by its interior volume of less than 500GT. Key features include a multitude of wellness areas on board, such as a superyacht gym, spa and beach club - providing guests with plenty of options for working out or relaxing. What’s more, the indoor and outdoor lounge areas have been designed in a modern style and can be easily modified to suit a client’s needs, whilst retaining an emphasis on comfort and light. As with every model in the BNow range, these yachts can be built with a reduced build time as Benetti would use a pre-engineered technical platform, thus accelerating the process at its Livorno headquarters. 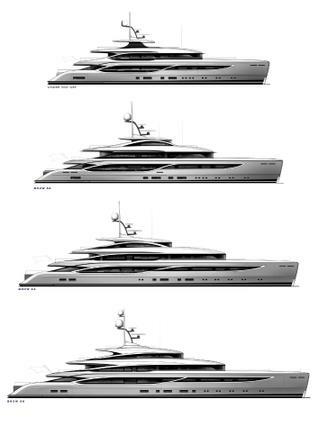 Other superyacht projects currently under development at the Italian yard include the 63 metre Project Balance, which was sold in September 2017 and is due for delivery in March 2019.